SCIREQ Inc.: Don't miss the opportunity! Do not miss the opportunity to learn on key laboratory techniques used in respiratory research by attending the workshop on Phenotyping Mouse Models of Human Lung Disease hosted by the Jackson Laboratory in beautiful Bar Harbor, Maine. 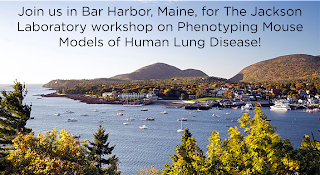 The workshop provides a unique forum to acquire strong theoretical and practical basis on key techniques such as respiratory mechanics measurements, airway hyperresponsiveness assessment, or lung volume determination. The organization of the event also favors networking with peers as well as with established researchers in the field. For years now, SCIREQ has been an active player in this event, as part of a long collaboration with the Jackson Laboratory educational programme. The workshop is therefore also a great opportunity to meet us, to see our products in action, and to get to work with them under the supervision of trained instructors and scientists. - Introduction to the flexiVent - Annette Robichaud, Ph.D., SCIREQ Scientific Respiratory Equipment Inc.